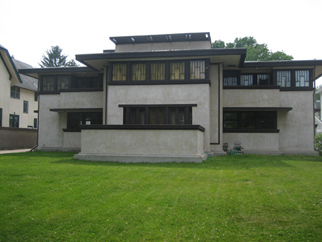 The Historic Preservation Commission’s 11-member board is proposing that the Frank Lloyd Wright-Prairie School of Architecture Historic District be expanded to match the current National Register Historic District boundaries. This is an important measure to better identify and protect the buildings that give the district its special character. The neighborhoods are full of interesting residential properties in a variety of styles, for example, Queen Ann, Prairie, Arts and Crafts, Craftsman, Bungalows and Colonials. The typical streets are beautifully scaled with consistently aligned one and two story facades with elevated open porches and welcoming wide stairs leading to decorative front doors. Garages are always located toward the rear of the 50-foot wide lots, diminishing their presence. This pattern establishes a friendly pedestrian scale, the envy of New Urbanism principals. According to Tracy Cross, of Tracy Cross & Associates, there are over 100 major Neo-traditional developments nationwide under construction, which are all modeled after 1920’s communities, such as Oak Park and River Forest. Conceptually their planning goals are to be transit oriented, dense and compact and designed to encourage walking. The principals include pedestrian-friendly land planning, grid pattern streets, short front yard set-backs, detached garages, elevations that incorporate vernacular styles and front porches that epitomize regional architecture. The planning encourages walking, biking and use of mass transit versus driving. Sound a little like our home town? The difference is we have layers of historically intact residences that are a treasure in this living museum of architecture. Our great task is to continually adapt, add to, restore and update in a way that preserves these fine structures while adapting them to meet modern demands. Preservation is about change, without losing the authenticity of the original designs. We must be vigilant to care for the historic materials that make up the community. The best tool we have embraced for the last 39 years is the adoption of Landmark Districts. Currently the Frank Lloyd Wright-Prairie School of Architecture Local District does not match the larger National District boundaries which were expanded in 2009. The National District designation does not give protection to the buildings, but serves only as honorary recognition. Therefore, the commission is seeking this expansion to help protect the 1,934 properties in 97 blocks all on the perimeter of the local district. One, inclusion in the historic district helps ensure that the properties will not be demolished and replaced with something that is much larger and out of scale with the rest of the block, or their exteriors are not drastically modified in ways that destroy the neighborhood’s traditional quality. Furthermore, it helps the village maintain those historic elements that make the Wright district such an interesting, pretty and enviable place to live. Two, financially being in a contributing property within the historic district makes them eligible for tax incentives for rehabilitation. Specifically, the three benefits available include: the Illinois Property Tax Assessment Freeze, the 20 percent Federal Rehab Tax Credit and the Façade Easement Donation. These programs are all designed to encourage sensitive restoration. Three, historic districts enhance property values while attracting heritage travel. The American Planning Association last year named the Frank Lloyd Wright Historic District one of 10 Great Places in America. I strongly support the expansion of this Great District from a preservation, economic and cultural point of view. The rewards are for the taking, contributing to our collective pride and personal quality of life. - Garret Eakin is a practicing architect residing in Oak Park, a Adjunct Professor of Architecture at the School of the Art Institute and a Historic Preservation Commissioner.